Thank you Roz for having me back to the Undercover Soundtrack. 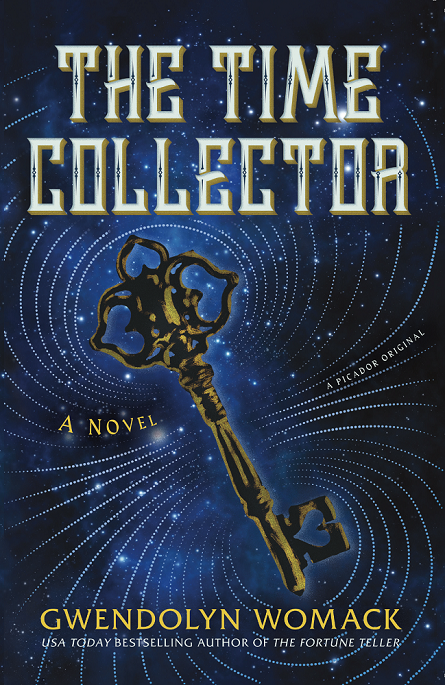 I’m thrilled to delve in and discuss the music behind my new novel The Time Collector. The story is a romantic thriller about two psychometrists. Psychometrists are people who can touch objects and see the past embedded within them. The pair become caught up in trying to solve the mystery of out-of- place artifacts (“ooparts”) that challenge the timeline of recorded history. Within the narrative, the story travels back in time periodically through the objects, and the answer to the ooparts’ riddle lies hidden within the fantastical world of crop circles, ancient crystals, and sacred geometry. The book has many aspects, so the music I listened to while writing was highly varied too. The main character of the book, Roan West, is a master psychometrist who has been peering into the past since he was a boy. He wears gloves to control what he touches and the imprints he reads. The only time he takes his gloves off for long periods of time is when he mountain climbs. He is an avid boulderer, someone who climbs without gear or ropes, and bouldering has become his outlet where he can recharge. I went on YouTube to research videos of climbers I found the climbers’ playlists to be so kinetic and full of energy. I ended up getting several albums and looping specific songs. They became Roan’s songs in my mind. The music I looped the most for Roan was from the album Emancipator by Doug Appling. I particularly loved the tracks Rattlesnakes, Nevergreen, and First Snow. The other psychometrist and main character in the story, Melicent Tilpin, is just starting out on her journey to becoming a psychometrist. For Melicent, I ended up looping A Chorus of Storytellers’s Within Dreams and Perro for many of her scenes. There is something elusively wistful about both pieces that struck a chord when I was trying to write her. There is one song in general that I listened to the most throughout writing the book. I first heard it on the internet as background music to a short video piece that Futurism.com was circulating and I loved it so much I researched what it was and how to get it. It’s a short piece of instrumental music called Stream by Sean Digo and I was able to download on Audiojungle. I looped it for countless hours (hundreds) and even now when I listen to it the song brings back so many memories of the writing. Parts of The Time Collector journey back in time through memories stored within objects. There were pieces of music that helped me write those historical passages. For example, within an antique music box lies the memory of 1700s Vienna and musical prodigy Regina Strinasacchi, who performed with Mozart. There’s a wonderful bit of backstory about the sonata Mozart composed for her and I wrote their chapter playing the sonata. For another object’s memory—hidden within the key to the astronomical clock tower in Prague in the 1400s—I listened to medieval music on YouTube. And another memory is imbedded within an exquisite Korean fan of a young girl’s life during the Korean War. The girl’s mother was a musician and I found traditional Korean music to help spark my imagination. The full playlist is on my website, but this one performer is how I imagined the mother to look in concert. An important flashback of the story takes place in Australia and I found some fantastic Aboriginal Didgeridoo music and another piece titled the Spirit of Uluru. I hunted all afternoon sampling music to find what I was looking for. Sometimes though, you don’t have to go hunting for music, the music finds you. That happened to me while I was watching the movie Sing with my son of all places. One of the songs is a remake of Golden Slumbers/ Carry that Weight. The lyrics struck me and felt connected to Roan’s journey at the end. Roan is carrying the weight of the world’s memories inside of him and trying to get home. I ended up listening to the song many times for inspiration to write his journey. The spark of inspiration happened quite on accident while watching a Sunday family movie. The two final pieces of music I want to mention is by one of my favorite artists James Hood. His previous album, Pure Ceremony, was pivotal when I wrote The Fortune Teller and it was incredible timing that his next album, Mesmerica, came out right as I was getting started on The Time Collector. The entire album is gorgeous! I ended up looping the songs Tapestry and Mesmerica the most, particularly while writing the end chapters. Last December I had the chance to meet James when I went to see his concert for Mesmerica. The show is an amazing 360-degree immersive art and music show that makes you feel like you’ve stepped inside a kaleidoscope. I highly recommend going. Visit his website to see if he’ll be coming to your city. To sample all the music that helped to inspire The Time Collector, the playlist is on my website. And if you’d like to read my past posts on Undercover Soundtrack, here are my discussions for The Fortune Teller and The Memory Painter. One of the most enriching aspects of writing is to find the perfect music to go on the journey. I have infinite gratitude for all these artists who inspired me along the way. Thank you for listening! If you’ve followed this series for a while, you’ll recognise my latest guest. Gwendolyn Womack writes romantic thrillers imbued with a sense of metaphysics, time and memory. Her stories come to her through music and her Undercover Soundtracks have always been haunting and unusual, with a strong sense of place and emotion. I urge you to check out her first time on the series, when she introduced us to an album recorded inside the King’s Chamber of the Great Pyramid in Egypt. For her new novel, she conjures a psychometrist who can feel the history in any object he touches – so her mental and musical soundscape includes 1700s Vienna, 1400s Prague and the red plains of empty Australia. Drop by on Wednesday for her latest Undercover Soundtrack. Letters to the Pianist, a story set amidst the bloodshed of WWII, is a parallel dance between that most powerful and complex of bonds: father and daughter. Joe, a Jewish greengrocer and his eldest daughter, Ruth – my two protagonists – narrate their own stories and in many ways sing their own deeply felt songs, as their paths take radically different directions, with at times, devastating consequences. Their story is about choices, the secrets we carry, overcoming challenges, and most of all, the importance of family. We always hope we have an angel to watch over us, but we don’t realise how our parents are the true guardian angels, for the good times and bad. Often I would lie in bed and play music, to find that special song, or a melody that could help me express their relationship journey. John Mayer’s song Daughters really helped me connect with Ruth’s complex bond with her parents – and her father’s absence in her life which mirrored mine (my parents split when I was only three) and that contrary emotion you can have with a parent. Fathers are, after all, the subconscious blueprint for a daughter’s future loves. Let’s travel into the blitz of 1941: a red-brick terraced house in London’s East End has been bombed in the early hours. And Ruth Goldberg, a Jewish teenager, escapes into a fantasy world to avoid the horrific reality of wartime life; the song Dream a little Dream of Me sung by Doris Day really helped me to tap into the dreamy, illusionary state she would sometimes drift into. One night, Ruth awakens in the pitch dark, still groggy from sleep, and buried up to her neck in bricks. Unable to move, she frantically screams for help, wondering if her parents and two younger siblings are dead. But this introductory scene is no work of fiction; the narrator is based on my mother, Ruth, who as a young girl, awoke to find herself orphaned and alone in this exact scenario. In the creation of a wartime world, a song tapped straight into this atmosphere of ‘rubble-strewn streets and a swamping sadness that hung in the air like the reek of burning flesh’ – along with that desperate sense of hope that Ruth needs to hold onto as she and her two younger siblings are parcelled out to relatives – Smile sung by Nat King Cole, which I played repeatedly until it seeped into every cell in my body and I was almost breathing it. Ruth, like my mother’s real life experience, believes that she is the ugly duckling, black sheep of the Goldberg family compared with her beautiful siblings – overweight, and spotty, she wonders if she perhaps deserves all this heartbreak, abandonment and loss. And yet there is hope for an internal transformation: My Funny Valentine sung by Frank Sinatra, really connected me to Ruth’s illusionary story of her own unworthiness, along with my mother’s that doesn’t reflect the reality, as she will learn to discover. Meanwhile, her enigmatic father, Joe, regains consciousness in hospital and soon discovers he can play the piano as good as the great maestros – and this becomes his saving grace, along with his good looks and charm as he marries into a sinister aristocratic family, and achieves fame as a concert pianist with a new identity – Edward Chopard. Although I had piano lessons from an eccentric French teacher in a housecoat when I was eight years old, I needed to impart that wild energy Edward feels when he plays, as he is moved from a deep space within, which he doesn’t fully understand, being sparked by savant syndrome. The Mozart symbolises his passionate side and empowers him as he revels in his good fortune, and yet, is it all as it seems? Edward has many faces that he reveals to survive this complex family drama in which he finds himself, and Liszt’s Dreams of Love evokes Edward’s loneliness, seeking truth and real connection, as the fragments of his lost family still haunt him. Joe/Edward is a lost soul, in search of who he really is: ‘Who am I?’ is a recurring question for him, and yet often our true selves are reflected back in the people we love. You Made Me Love You sung by Nat King Cole is a song that threads through the story and stirs old memories, and underpins the unfolding of his real identity. Halfway through the story, fragments of Edward’s memories begin to return. This is triggered when he receives letters from his supposed long lost daughter, Ruth, after she sees a photo of a pianist who reminds her of her dead father in the newspaper, stating that he will be performing at the Proms. It Was a Very Good Year sung by Frank Sinatra really sums that up Edward’s mixed feelings. He knows things aren’t right – the family he has married into have dark affiliations to Hitler – but he often sees events with pink tinted vision – out of fear of seeing the truth, until he has to face reality. SD Mayes worked as a journalist for nearly 20years before turning her hand to fiction. Inspired by her mother’s tragic memories of wartime Britain, along with the bizarre but factual events of Hitler’s obsession with the supernatural, Letters to the Pianist is her first WWII suspense novel. She lives in Berkshire, UK, with her teenage daughter and their voluptuous cat, Saphy. Find her on Twitter @authormayes, Facebook, Goodreads and her website. Hello! It’s been a while since I’ve had an Undercover Soundtrack guest, but that doesn’t mean it’s muted forever. I’ve been writing, and the soundtrack collection for my own book is almost as tall as its namesake (Everest). Meanwhile, I’ve bumped into a few people who would be perfect guests and this week you’ll meet the first of them – SD Mayes. Her novel is called Letters To The Pianist, which you’ll probably agree makes her the perfect first act for the second act of this series. 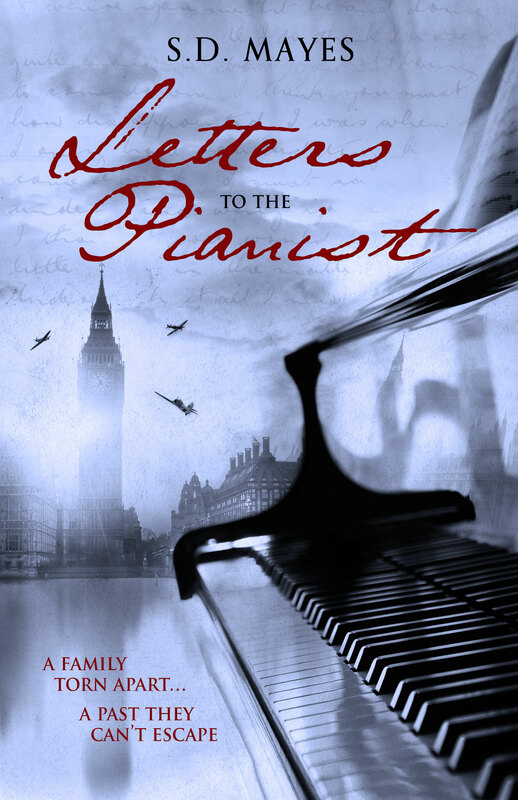 Letters To The Pianist is set in the London of World War II and draws heavily on the author’s own family history. Music was a route map for the key emotions of the characters – from fantasy escape, feelings of teenage inadequacy and the feelings of wild abandon that come from communion with an instrument. Drop by on Wednesday to hear more. On January 11, 2018 I will have my book launch party at Women & Children First bookstore in Chicago, reading excerpts of The Hope Store accompanied by ambient music. The music will be an overt soundtrack, not the undercover soundtrack I am about to describe. 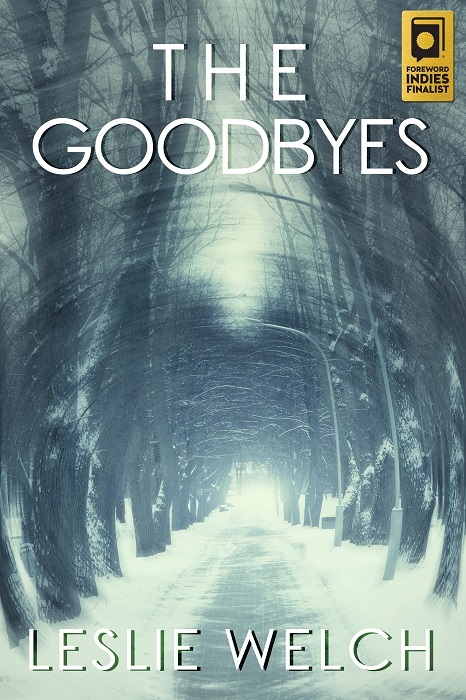 This speculative novel has always been structurally a kind of duet: the chapters of the book alternate between the voices of pessimist Jada who is a customer and optimist Luke who is one of the store’s creators. At times those voices harmonise, are dissonant, or simply collide. How do two characters with different worldviews see the same event, the same story? Are some realities more real than others? And most importantly: what is hope and how do we make more of it? 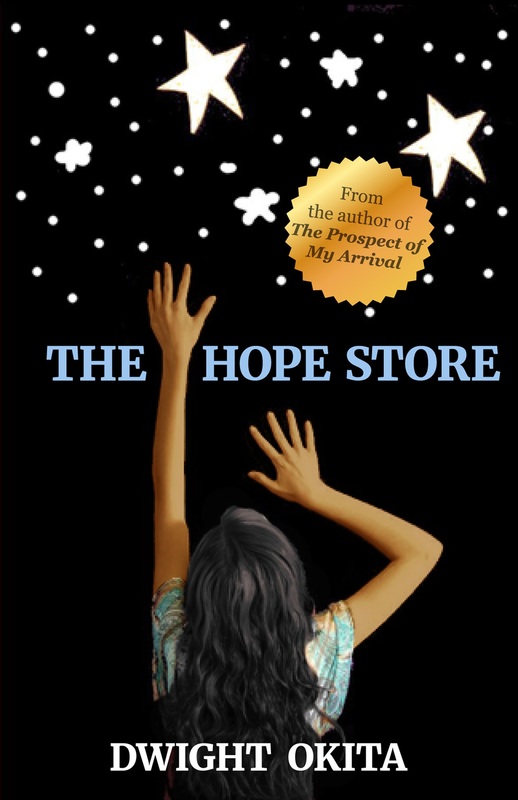 The Hope Store tells the fable of the first store in the world to sell hope over the counter, the creators of this procedure that opens new paths in our brains, and the individual lives that are changed as a result. As often happens, complications ensue. I always pictured that the climax of this book would take place at a townhall meeting hosted by CNN. And that is exactly what I wrote. Toward the end of the novel, it is almost Christmas, almost the new year. The auditorium swirls with opinions articulated by The Enhanced Hopers who bow down at the altar of science — and opinions of The Natural Hopers who believe one should only have the hope you were born with. This latter group hates science and secretly fears it. During this long night, the arguments range from the sublime to the ridiculous. The audience is filled with skeptics, believers, and everything in between. The whole world is watching. Where did this book come from? At some level, this book is a metaphor for my own healing. In years past I’ve battled generalised anxiety disorder which is characterised by relentless dread, debilitating social phobia which at times kept me home-bound, and a relentless moodswing that lasted over two years. In many ways I am both Luke and Jada, the healer and the person who needs to be healed. The shelves of my own unique hope store have been lined with an array of modalities including Buddhist chanting, therapeutic cuddling, and pharmacology. If Nichiren Buddhism has taught me nothing else, it’s that each person at some point must confront their own fundamental darkness — and conquer it, or at least tame it. Failing that, the person is doomed to a life of incessant suffering. To me, every story is about that: A hero coming face to face with that terrifying darkness — whether it resides within him or lurks somewhere outside himself. When my book launch party finally occurs, I will not read to music that causes a story to happen, but to music that immerses the audience in the experience of the story. Think of children around a campfire late at night, how the flames add light, heat and even danger. Thanks for reading this post. I hope you enjoy this book as much as I loved writing it. Namaste. The hope in me honours the hope in you. It’s such a pleasure when an early contributor to this series returns with a new title. 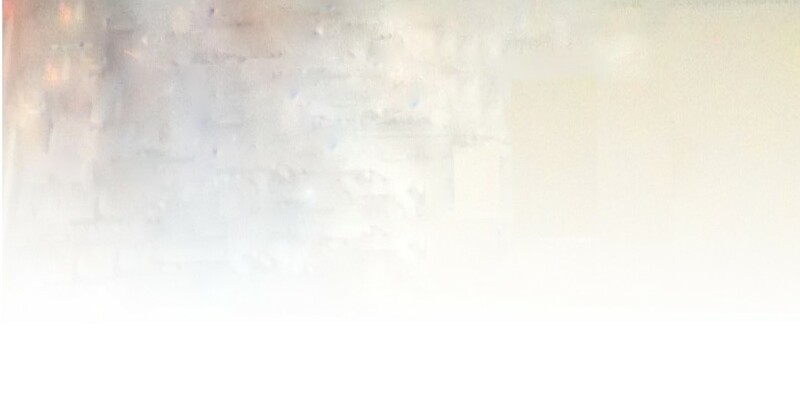 Today we’re rewinding to a guest from the first year of The Undercover Soundtrack. Dwight Okita was a finalist in the coveted Amazon Breakthrough Novel Award with The Prospect of My Arrival, a story that flirted with ideas of the supernatural and reincarnation. Now with his second novel, The Hope Store, he’s created a low-key magic realism/science fiction fable that centres around an invention that can bring happiness. Music was important for keeping him on message, and Dwight’s muses included U2 and my own favourite, Kate Bush. Drop by on Wednesday to hear more. I have always approached listening to music as an activity with dedicated purpose. When I YouTube the Violin Concerto by Felix Mendelssohn, recorded in 1949 by the great Russian violinist David Oistrahk, I sit quietly. I listen intently. Whereas many use listening to music as an aural inspiration to enrich a meaningful calling such as writing, I can only view music as a powerful life force which has had profound implications for me. Because music was, for over 25 years, my profession. 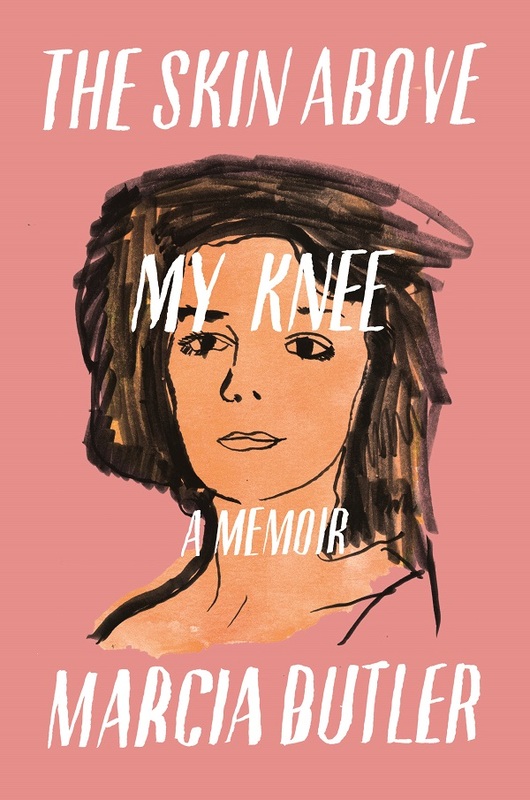 My memoir, The Skin Above My Knee, tells of my experiences as a professional oboist in New York City during the 1970s, 80s and 90s, in which I attempt to unpack what it takes to be a hardworking classical musician. Juxtaposed to this, my personal narrative as a damaged young woman sings in opposition, accompanied by all the dangerous life choices I made. Ultimately, discovering and then performing music actually saved my life. I was eager to write about events that elicited exceptional results, both professional and personal, both beautiful and awful. What does being on stage at Carnegie Hall really feel like; what must a musician endure to maintain excellence; what happens when things go very wrong in a concert; and what transpires when music takes over and musicians surrender to the sway of something more powerful than themselves? But also, how might writing about the music I love tell my readers something important about me in a way that further illuminates the personal narrative of my life. All this. When something is a forever thing, such as music, it is natural to want to be enveloped by these wonderfully organized sounds and use music as a companion to almost any activity. When writing my book, my challenge was not to decide which music might inspire me and then coax out my best work. Rather, my task was to mentally catalogue all the music I’d ever played; all the musicians with whom I’d performed; all the teachers who taught me everything and very little; all the conductors I’d dismissed because they knew nothing, or revered because they understood absolutely everything; all the concerts that changed my life, or humbled me and brought me to my knees. I had to think deeply to remember, and also dredge up what I longed to forget. Siegfried Idyll by Richard Wagner will always represent a song of prescience and possibility. Performing this music in a church in New York City literally gave me the courage to wrench myself from a violent husband. This profound composition, written for the birth of Wagner’s son, touched within me a place of naïve clarity. During the concert, I became aware that my current life would need to change. This notion – an urgent imperative, actually – washed over me while I was playing the oboe. Somehow, I was able to glean the realization only through music. When one cannot do something, there is always the option to give up if results are not reached in a reasonable time frame. But for a musician, nothing creates more urgency to succeed than a concert engagement. When I was invited to perform the Oboe Concerto by American Composer Elliott Carter, I took this difficult music into my hands, practised it, lived it, hated it, and cried a lot. All because I couldn’t play the thing. Not even close. Panic quickly set in because I was certain I’d finally be identified as the fraud any artist deeply believes themselves to be. Trying to play Carter’s music is how I became bedfellows with pure, endless failure. I’d turn over during fitful sleep and kiss this devil on the lips. Finally, after many months the music showed me the way. I ultimately mastered it and thereby found my love for it. More importantly, I learned to not allow any difficulty to dictate my future. That music lesson was a life changer. Rock-star jazz musicians are not always odd, or unapproachable, or just too big for their britches. Sometimes they are just the nicest people on the planet. And sometimes they hire a random oboist (you) to premiere and record their oboe concerto, solely on the basis of hearing a tape of your playing. That piece is played often on classical radio stations for years and years to come. And sometimes that is a boost you badly need, because many times you are facing the next impossible piece of music. And it makes you very humble and grateful because you’ve learned that music is the great equalizer among musicians. There is no low or high; no strata of fame. No. When musicians collaborate, music is simply the smartest thing in the room. And yes, thank you, Keith Jarrett. Music is the conduit through which we can discover ourselves. It is always a willing and available companion. Because when music resonates, those sounds remain in the universe forever. Sound never fully dissipates. We know this because scientists are now listening to noise that originated over a million years ago. No other art form – not visual, not drama, not dance, not even writing – can claim this distinction of eternity. Simply put, there is not a person on Earth who hasn’t connected deeply, in some way and at some time, with music. It is an aural glue to feelings, memories and hope. My guest this week has written a memoir of life as an international concert oboist, juxtaposed with a parallel narrative of a precarious and troubled personal life. I first came across her on The Literary Hub, where she wrote about how she left the very worst experience of all out of that book. It was so haunting that I contacted her and asked if there was any way she could write a piece for this series. She has, and the result is a trip through music that has helped her remember, or dredge up the times she preferred to forget, and moments when music helped her make life choices because of the clarity and discipline of playing. Stop by on Wednesday for the Undercover Soundtrack of Marcia Butler. Intrigued by the invitation, my husband and I made the 22-mile drive from our hotel in State College to the post-industrial town. Back then, Millheim was growing into the unlikely heart of a serious music scene in Central Pennsylvania. That visit would eventually work its way into a novel I didn’t know I was going to write. A tangle of cords, amps, and a giant mixing board crowded the back of the sanctuary where greeters used to welcome people to worship. Mics were set up wherever there was good, natural reverb. Not a computer in sight. Two towheaded boys chased each other through the pews in loops around us as we checked out the set-up. ‘Who are the kids?’ I asked. Eight-year-old Gus scooped up his fiddle and ripped out a quick melody that sucked me into a serious religious moment. The kind of experience that makes you doubt you could ever be good at anything in your life. That’s what happens when you experience a prodigy in person. Here’s Gus Smith. Gus, undoubtedly used to these impromptu performances, gave us a look that asked if that was enough of a demo. Before our claps faded into the narthex, he was back to the business of chasing his brother around the church. While the idea for my novel The Goodbyes wouldn’t come for a few months, I collected plenty of inspiration at that session. Fast forward to November of 2014. With an idea begging for a blank document and a NaNoWriMo deadline, I sat down to write. Since the story was about Webb Turner, a rock star who races through a blizzard to possibly say a final ‘goodbye’ to the girl who inspired his songs, I packed my writing playlist with songs I thought Webb might write. Snow Patrol, Coldplay, and The Temper Trap dominated the two-hour loop. But when I pressed ‘play’, I found myself skipping each track after a few seconds. I switched over to my music library, hoping the universe would step in. Song after song, nothing kept me writing for more than a sentence until I skipped my way to the one thing I would have never chosen—Tibetan Monks chanting. Yes, really. I didn’t care what it was, it shifted me into the zone. I tapped out a chapter or two on the train ride home. When I wasn’t writing, I listened to popular music from the 90s and early 2000s. Green Day, Red Hot Chili Peppers, even Kanye West and Nickelback transported me back to the spirit of that time. These songs play in the background of a lot of scenes in the book. They’re important to the characters, too. I finished the first draft in a month. Once I had let it rest for a few weeks, I started the slow and painful process of editing. It wasn’t long before I realised that I needed more than ‘Oms’ to paint the flesh onto the bones of the story. My filmmaker husband suggested listening to movie soundtracks for some momentum. I quickly discovered that these epic melodies, swelling and crashing without apology, are gold for writers who want to add drama to key scenes. The Great Expectations soundtrack hit an especially sweet spot for me. When it comes to creating a writing playlist, what works for one book might not work for the next. My current manuscript likes The Lightning Strike by Snow Patrol and Radioactive by Imagine Dragons. It’s a nice change, but in the end, the most important thing is finding anything that inspires me to keep moving until I can punch out the two best words in a writer’s journey: The End. My guest this week began her novel as a NaNoWriMo project, appropriately enough for this time of year. But its true seeds were at a gig in the late 1990s where the show was stolen by an eight-year-old fiddle player. Years later, the author sat down to power through a manuscript idea for NaNoWriMo. She used songs of the 90s and early 2000s to take her mind back to the night with the fiddle player, but nothing would make the words flow until an album of Tibetan chants popped up on her music library. She found the zone. She is Leslie Welch and she’ll be here on Wednesday with her Undercover Soundtrack. You are currently browsing the archives for the Undercover Soundtrack category.